With figures from China indicating growth in industrial production for the first time in three quarters, the demand for WTI oil was given a welcomed boost. After struggling at the bottom of three month lows, WTI finally broke away climbing as much as 0.2%. 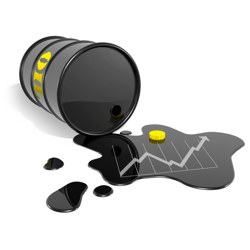 Overnight oil futures gained some momentum with the current price trading at $101.2 per barrel. With the dollar considerably weakened, gold soared as traders view the metal as an attractive hedge. Gold futures traded at $1320 during US hours, up 3%. The Editorial Team will now be out of the office for the next 8 working days and back on 31 Oct. In the meantime, good luck with your trading. There was little change in WTI crude even after concerns of a US default were pushed into the distance. After advancing yesterday, oil futures fluctuated but took no real direction even after the bill the passed, WTI now stands at $102 per barrel. Gold prices have been swinging on the back of 'progress' in the US. Now that a short-term deal has been stuck, the focus is back on the Federal Reserve reducing stimulus. It seems as though a lot of forecasters are seeing a distinct price drop in gold over the next four quarters as investors lose faith in bullion as a store of value. WTI crude oil futures saw some large swings yesterday, ultimately closing 1.2% lower. The price, which is still trading near its three month lows, failed to gain any momentum as the deadline loomed for US lawmakers to reach a deal on raising the debt limit. With Iranian negotiations also taking place for a second day concerning the country's nuclear program, we could see more volatility in the energy markets. Gold fell for a fifth session out of seven yesterday on expectations that US lawmakers will finalise a last minute agreement to lift the debt ceiling, meaning that investors feel less obliged to use gold for protection. Looking at the spread trading charts, the metal dropped to an intraday low of $1,251.85 but managed to recover to $1,275 as negotiations stalled. US crude oil ended higher yesterday, mostly on the back of news suggesting that the President was set to meet Congressional leaders later in the day. This shed a ray of hope that a deal would be made concerning the budget and debt ceiling. The US treasury announced that if a deal to raise the debt ceiling limit is not finalised by 17 October then the world's largest economy will risk a sovereign debt default. Gold swung between highs and lows amid speculation of when a deal will be struck between the government and US lawmakers in order to end the 2 week partial government shutdown. Ultimately, the precious metal closed 0.5% lower at $1,266.4 yesterday, before gaining 0.3% to hit $1,274.53 during today's Asian session. In the commodities space, US crude oil fell for a second consecutive day. With negotiations still taking place in the US concerning the government's debt limit, concerns are growing that a potential default may slow global economic growth and reduce fuel demand. There has been little change in the price of gold futures, with the price swinging between gains and losses above a three-month low. Gold, along with many other spread trading markets, continues to be heavily influenced by what's been happening in Washington. The Comex currently has the price of gold at $1,269.8.